“The past four decades have witnessed enormous innovation much of which is now commercial or becoming commercially cost-effective, energy efficient lighting systems being a case in point”, said Achim Steiner, UN Under-Secretary General and UNEP Executive Director. “Governments and local authorities have significant purchasing power which can accelerate the evolution of markets in favour of low carbon, resource efficient goods and services, a key outcome of last month’s Rio+20 Summit in Brazil under the theme of sustainable procurement”, he added. “UNEP is proud to be partnering with the government, the private sector and civil society to demonstrate that a transition to an inclusive Green Economy is happening and do-able in both developing to developed countries, from the public policies that are triggering a surge in renewable energy in Turkana and Naivasha; the energy efficient, solar-powered new offices of the UN at Gigiri to this piloting of LED lighting on UN Avenue, Kenya is indeed glimpsing a very different, more sustainable future for its citizens, the country and for Africa”, said Mr Steiner. The UN Environment Programme (UNEP) headquarters is based in Nairobi, and this is also true for the UN International Year of Sustainable Energy for All, 2012. This makes Nairobi the perfect place to start this pilot program, to showcase the capability of Philips Solar LED Street Lighting, and how it can help to provide a cleaner and better future. At the same time this innovation has the potential to transform urban and rural life in areas of the world which do not have access to the electricity grid, or where the grid is unreliable, and improve the quality of life for the population in the area. 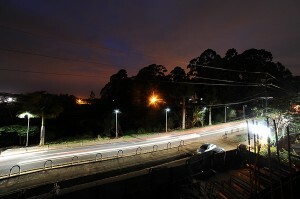 It will help municipal authorities create more liveable urban environments by applying new, future-proof LED lighting solutions to enhance city and rural life, and at the same time make them safer and more productive. The key to the breakthrough lies in the combination of new High Brightness LEDs with unique patented optics and an intelligent controller which lies at the heart of the solution. This ensures that the maximum amount of power is transferred from the solar panels to the batteries (30% more efficient than traditional charge controllers). It also ensures that the charging and discharging of the battery happens in an intelligent way to maximize battery life. It can also dim the light levels when required, based on a self learning intelligence and a history logs. The cost and size of the batteries, and solar panels can be reduced significantly, by as much as 50% compared to standard solutions being offered in the market today, thanks to improved high energy efficiency.